The 45-point AF array covers an impressive 62% of the horizontal width of the total picture area, and 48% of an image’s height with the central “stack” of AF points. The EOS 80D’s AF system provides coverage for nearly half of the image’s height, and the horizontal coverage for 62% of the total width of a full image. This AF coverage means easier compositions, especially with subjects significantly off-center — minimizing the need to lock focus and re-compose. There are numerous methods to quickly move from a center AF point to an off-center point (more on that later). 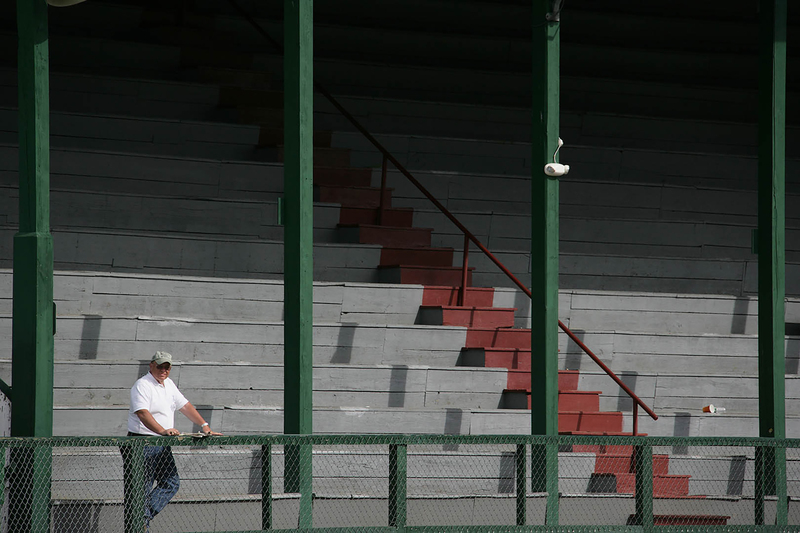 And, the 45-point array actually expands AF coverage beyond the traditional “rule of thirds” boundaries. 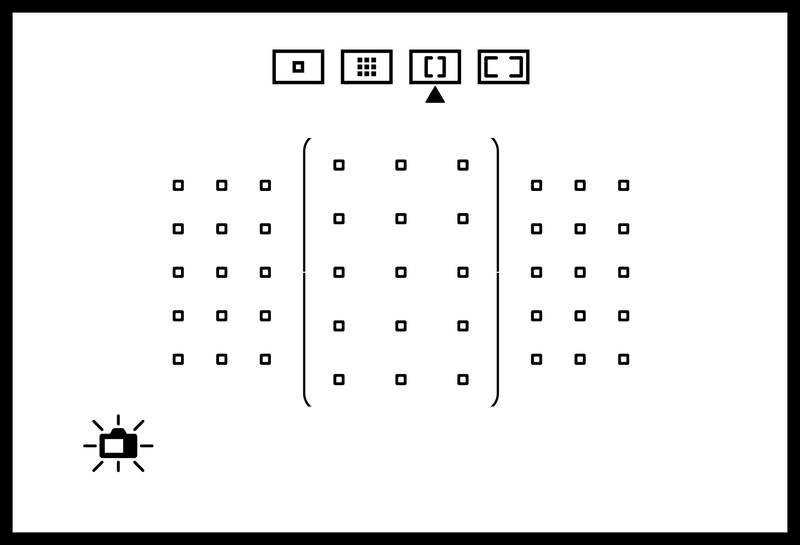 If you think of the 45-point array in terms of its Large Zone AF layout (one group of AF points to the left, a central group, and one to the right), the upper points on the inside of those left/right groups roughly correspond to rule-of-thirds composition. The four highlighted AF points on this graphic indicate approximate intersection points for traditional “rule of thirds” composition. The camera cannot highlight these AF points nor display the dashed lines shown in this graphic, but these four AF points can be a very useful reference during actual picture-taking — especially if you’ve turned on the EOS 80D’s AF Point Display during focus setting to “All (constant).” That’s done with Custom Function C.Fn II-14-1. In non-technical terms, this means that the cross-type AF points in the EOS 80D are more likely to acquire focus on what are sometimes considered “problem” subjects than a less-advanced camera having only single-line AF coverage at a given AF point. That’s especially true when a photographer tries to focus using AF points that are off-center. You don’t see this cross-type coverage in the viewfinder during ordinary shooting, of course, but understand that with the majority of lenses, each active AF point you do see usually is providing you with coverage at the AF sensor in both horizontal and vertical dimensions. And, this doesn’t require specialized, wide-aperture (“fast”) lenses. On the contrary, this cross-type AF coverage is possible with most — but not all, unfortunately — Canon EF and EF-S lenses with apertures f/5.6 or faster. * The vast majority of currently-available Canon EF and EF-S lenses provide cross-type coverage at all 45 AF points. Among current lenses, noteworthy exceptions are the EF-S 10–18mm f/4.5–5.6 IS STM lens (all 45 points active, but cross-type AF only at central 15 points); the EF 11–24mm f/4L USM (outer-most vertical row at left/right become single-line sensors; cross-type at all other AF points); and the EF 100mm f/2.8 USM macro lens (without IS), which limits AF to the central 35 AF points, with cross-type coverage at the central 15 points. Note that many older, discontinued EF and EF-S lenses may limit AF coverage as well. The center AF point offers another feature. Without any input from the photographer (changing menu settings, etc. ), if you mount a compatible Canon EF or EF-S lens with an f/2.8 or faster maximum aperture, the AF system changes how the center AF point is covered. It switches from standard-precision, cross-type AF coverage (with the cross coverage arranged similar to a lower-case letter “t”) to a higher-precision type of coverage, and uses diagonal AF line sensors. The diagonal arrangement is less likely to be thrown off by horizontal or vertical details we so often see in real-life subject matter. 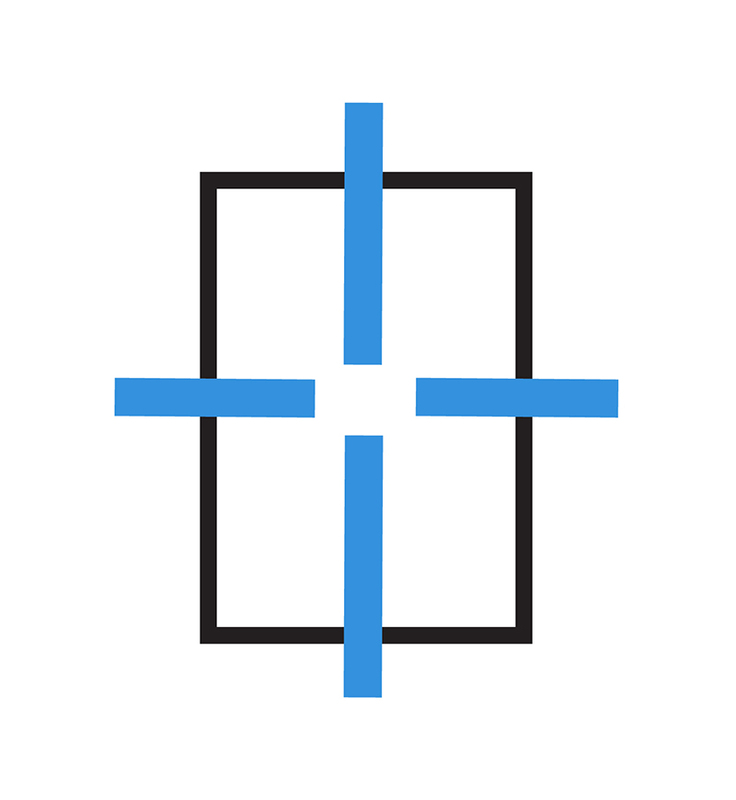 And at the AF sensor, these diagonal line pairs are positioned much farther apart, meaning that the AF system can be much more sensitive to tiny changes in focus distance, and communicate these to the lens for greater accuracy. Many real-world subjects have pronounced horizontal and/or vertical details, such as this image. The EOS 80D’s diagonal arrangement of AF line sensors at the center AF point — when f/2.8 or faster lenses are used — makes it easier for the center AF point’s higher-precision AF to latch onto this type of detail, using both halves of the cross-type coverage. Remember: for technical reasons, the phase-detection AF systems in SLR cameras can work well with subject detail that falls perpendicular to how a line sensor is arrayed, but if it’s close to parallel to an AF point’s line sensor, the AF system is almost blind to that detail. And, compared to the previous-generation EOS 70D (which offered similar diagonal cross-type coverage with f/2.8 or faster lenses), the EOS 80D’s new AF sensor now doubles these high-precision line sensors, in a slightly off-set “zig-zag” pattern, to further improve focus detection with finely detailed subjects. The result should be even better AF performance, at the center AF point, for users of wide-aperture lenses. Here’s a conceptual view of what’s happening “behind the scenes” at the AF sensor for a given AF point. With standard, cross-type coverage, a PAIR of rows of pixels on the AF sensor are arranged horizontally, and another pair vertically. Placed relatively close together, each pair can offer AF sampling, and do it with most lenses, with a good level of accuracy and precision. EOS 80D’s center AF point changes operation when a lens with a maximum aperture of f/2.8 or wider (lower f-number) is mounted. 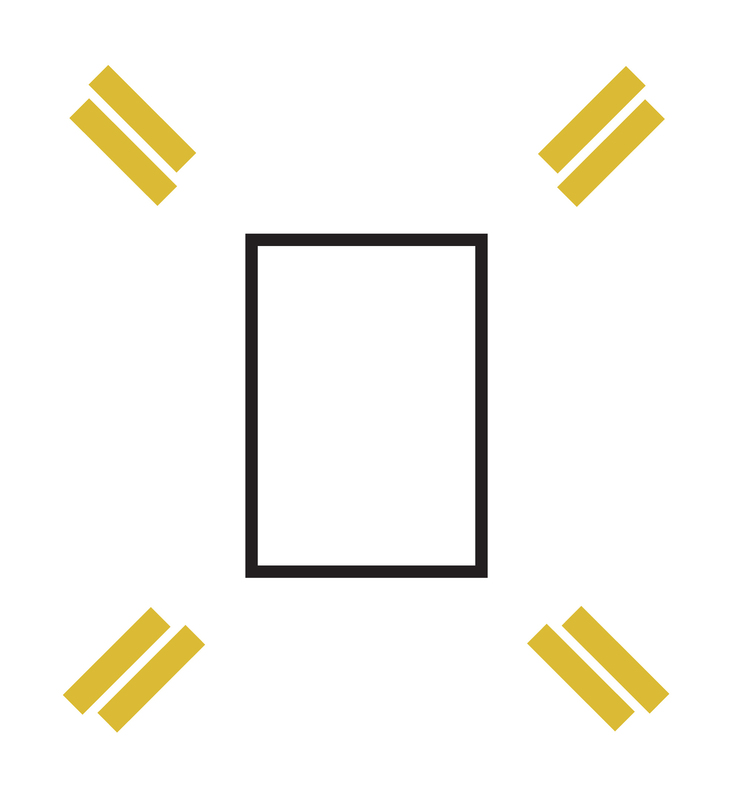 Note the following, in this conceptual illustration: 1) The line sensors are arranged in a diagonal cross, rather than a standard cross (more like a letter “X” than a letter “t”). 2) The line sensors are much farther apart than on the conceptual illustration for standard cross-type AF coverage. By positioning the pairs of rows of pixels farther apart on the AF sensor, tiny changes in subject position can be more precisely read by the AF system. 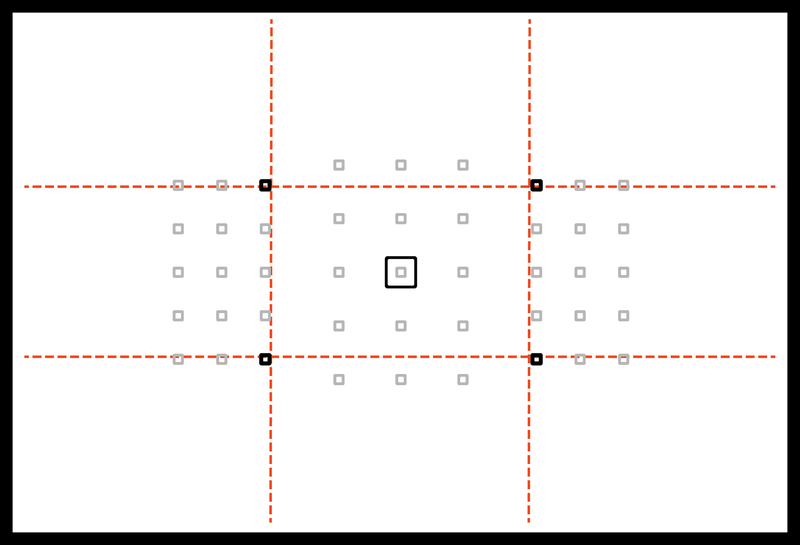 3) There are TWO adjacent rows of pixels for each component of the diagonal cross-type sensor array, not just a single row. By using double-rows of pixels, slightly staggered in arrangement, even tiny details can be more precisely analyzed and focused upon. This double-row arrangement is a new update on the EOS 80D, vs. the previous EOS 70D model. Like many advanced Canon EOS D-SLRs, the EOS 80D allows users to not only select from an array of AF points — center, off-center, and so on — it also allows users to change the active area, or size of an AF point. We’ll go over the options here, and mention some real-world examples of where you might want to consider applying them. • Be sure the camera is in a Creative Zone exposure mode (P, Tv, Av, M, or C1–C2). In the fully-automatic Image Zone modes, or the Green Zone (full auto) setting, you are always working with Automatic AF point selection, and can’t change it. 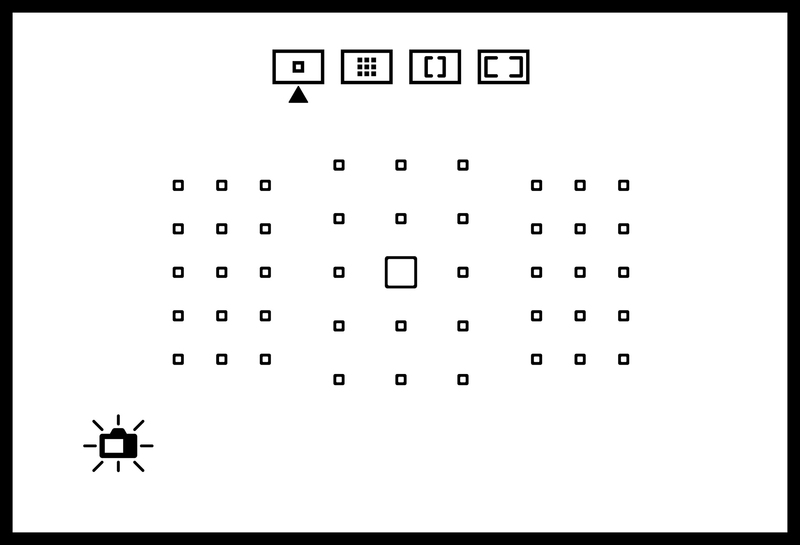 Indicated by a thin outline around the entire 45-point AF array, Automatic AF point selection means that all the AF points are active, and the camera will automatically select the AF point(s) to use to focus on the scene in question. The AF point, or points, which the camera decides upon will briefly appear in the viewfinder once you’ve activated focus, allowing you to verify where the camera is focusing. 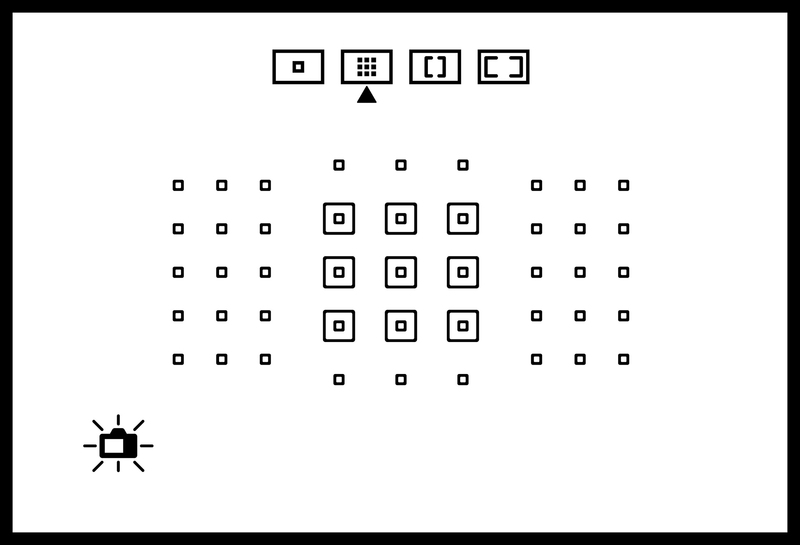 Automatic AF point selection is indicated by the thin black outlines, visible in this graphic, which surround the entire 45-point AF Array. If you see these outlines, you’re set to Automatic AF point selection! Automatic AF point selection works in both One-Shot AF mode (where it usually focuses upon the nearest subject) as well as AI Servo AF (it can be set to begin focus three different ways, via Custom Function II-11). Please note that in this and the following graphics, the icons which appear during AF Area selection are visible toward the top of the image area, along with an arrow indicating the current setting. These don’t appear during actual picture-taking. Also, the EOS 80D’s electronic level icon appears in these graphics, on the lower-left corner; that’s unrelated to your choice of AF Area. We’ve seen this on recently-introduced Canon EOS D-SLRs, like the EOS 7D Mark II and EOS 5DS series models, but this is the first time it’s present in a mid-range camera. Large Zone AF provides a generous-size cluster of active AF points. Three possibilities exist: all 15 central AF points, or the 15 points to the left or right. New to the EOS 80D is the ability to select a large cluster of AF points (with a thin border surrounding them — in this graphic, the center zone is selected), and have the camera automatically focus upon the nearest subject within the zone. Large Zone AF is actually an effective way to focus on the nearest part of one or more moving subjects. 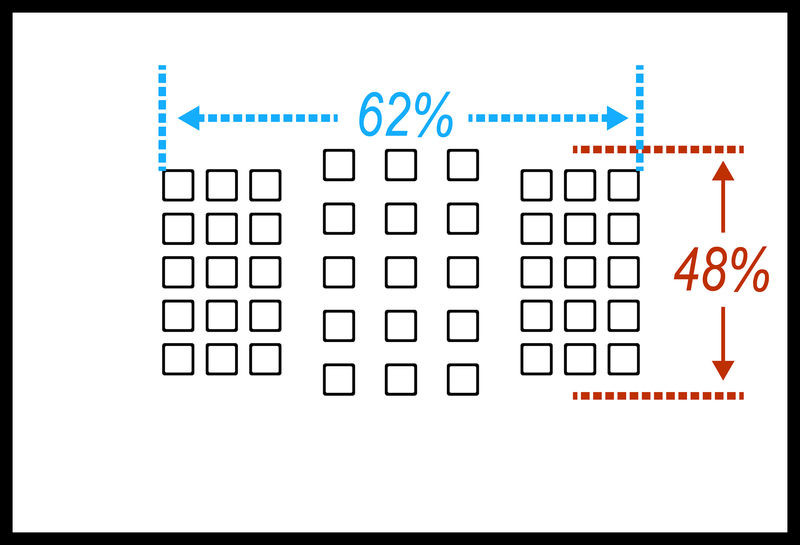 Once Large Zone AF is selected, a thin border line forms around the grouping of AF points you’ll be using. And, the camera will normally try to focus on the nearest subject(s) within the zone of AF points you’re working with. Finally, note that the three pre-defined Large Zones are the only ones possible to select in Large Zone AF… you can’t “nudge” the zones sideways to change the area they cover, nor can you change the size of the three Large Zone clusters of AF points. Large Zone AF can actually be a very useful way of focusing during AI Servo AF, with moving subjects, in situations where you know you want to preserve focus on the nearest of several subjects (think of a flock of several birds in flight, or a group of runners clustered together). And, it can likewise be a good choice when shooting a single large object that’s moving, such as a car, if you want the nearest part of the subject to remain in sharp focus as you track its movement. A subject such as this illustrates a possible use of Large Zone AF. With its tendency to keep focus on the nearest part of a subject, even a moving one, Large Zone AF can make a sharp sequence possible. For instance, if the central Large Zone was selected, its coverage extends low enough to insure that the car’s leading edge — toward the bottom of the frame — can be kept sharp as the car approaches the camera position. The concept is similar to the new Large Zone AF, but now, using smaller groupings of AF points. Zone AF allows you to pick any one of nine possible Zone locations, and within that cluster of AF points, the camera will try to focus upon the nearest subject to the camera. And, like the Large Zone AF setting, this is the case whether you’re in One-Shot AF, with stationary subjects, or focusing on a moving subject with AI Servo AF. Canon’s traditional Zone AF is also possible with the EOS 80D. 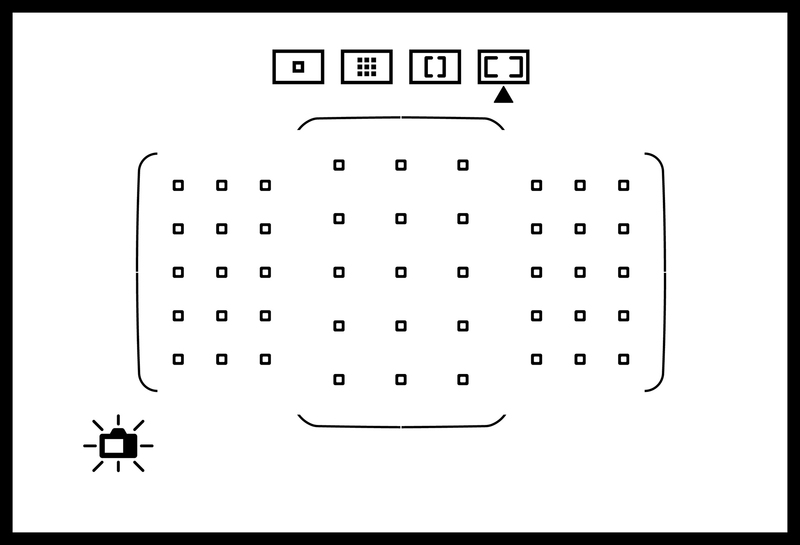 In this illustration, the center zone is selected. Once set to Zone AF, the EOS 80D user can manually move the active zone up or down, and left or right. Nine possible zone locations are possible. Again, you can’t change the size of the zone itself within the Zone AF setting, nor can you “nudge” it to the left or right. But, it remains an effective way to expand the size of your AF area, and retain focus on whatever is closest to the camera. This is the basic AF Area selection that many experienced SLR users will want to start with. Sometimes called manual AF point selection, you are working with one single AF point at a time. You can manually move that point anywhere within the available range of the AF array. Thus, you can move from the center AF point to a left or right location, or easily move upward to focus more on faces in typical portrait type shots. But Single Point AF is just that — you’re always working with one single AF point at a time. To expand the size of it, you have to change the active AF Area to either Zone AF, or to the Large Zone AF setting. Sometimes called manual AF point selection, for many experienced shooters, AF point management begins here. You select and work with ONE AF point at a time, and you’re free to manually move it anywhere within the active AF array. It’s ideal in situations where you want to more precisely place focus on one subject, or one particular part of a scene. And, the EOS 80D gives you some nifty tools to speed-up the process of manually moving from one AF point location to another. An important additional feature of the EOS 80D’s new AF system is its ability to focus at effective maximum apertures as slow as f/8. Telephoto shooters who often want to work with Canon-brand tele-extenders, rejoice! We’ll expand on this in a separate “What’s new” article on the EOS 80D, here on the Canon USA Digital Learning Center. But f/8 AF aside, this new 45-point AF system offers some extremely compelling flexibility and focusing performance. For some, the new AF system (combined with the EOS 80D’s ability to shoot at up to 7 frames per second) may be sufficient reasons to lean in its direction, rather than an even higher-end camera. And, for many, it opens doors to potential photographic and creative growth that today’s entry-level digital SLRs are hard-pressed to match. Finally, in spite of all its creative possibilities, it’s equally at home simply resorting to Automatic AF point selection, and casual shooting. The digital SLR continues to evolve, and the EOS 80D’s advanced 45-point AF system is an example of how technology that once was considered unthinkable, and until recently was often limited to expensive, top-of-the-line cameras, has entered the photographic mainstream.